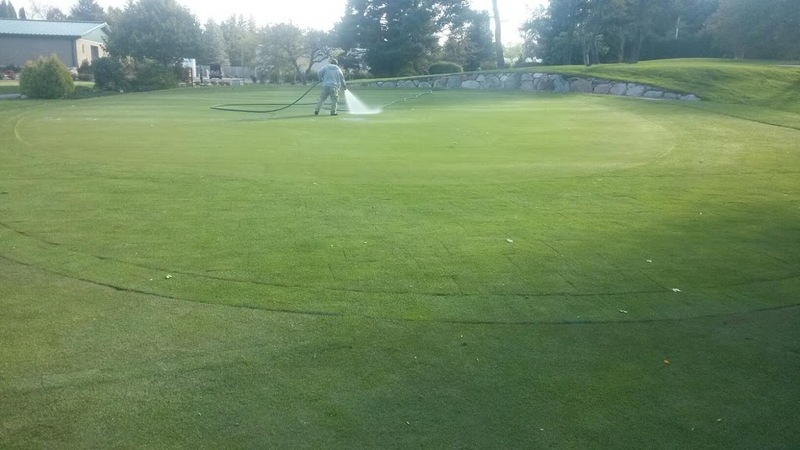 Cristobal Gayosso and crew recently completed a 6 green project at Midland CC, MI about 1.5 hours north of Detroit. Architect Gilbert Currie first laid out the original 18 in 1928, and 8 of his original pushups greens have stood the test of time. It was these original eight greens that GCS Eric Kleinsorge had us outfit with our classic green drainage system. The original green pad had shrunken in over several decades of mowing patterns and the club was looking to add new pin positions as well. 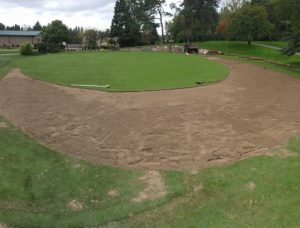 So, firstly we removed sod on the green expansion, and then drained the green and expansion simultaneously which included “XGD in the dirt” for the expansion. 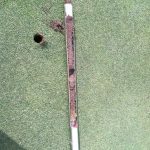 Next, the crew lowered the sand dam 2-3″which was in the collar on the shrunken green pad, and then cut out 2-3″ across the whole expansion and added an 80:20 greens mix which closely matched the topdressing layer throughout the shrunken green pad. 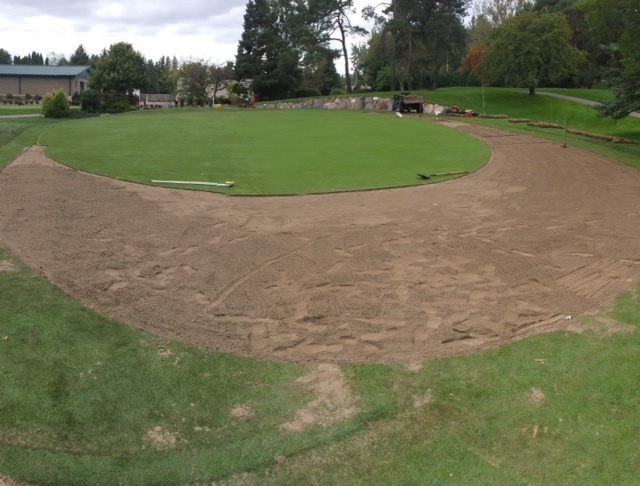 Lastly, after completing a perfect tie-in through out the green expansion perimeter the salvaged collar/approach sod was relayed and rolled in. And Voila, you have a new expanded green closely matching the internal and external characteristic of the balance of the remaining greens at Midland CC. The maintenance staff will now slower lower the height of cut on the new expansion over the course of the next 12 months, as well as an aggressive topdressing and verification program, and by that time the final product will be seamless to manage and will blend in splendidly. So, please reach out us if we might assist your facility in completing similar greens regrassing or expansion projects.